First century Spain was divided into three provinces: Lusitania and Baetica in the south, and Tarraconensis in the north. While the southern and central areas, once subdued, were quickly Romanized, the northern areas, up into the Pyrenees, maintained a ‘seething’ peace. Although the siege of Numantia in 133BC marked the end of organized resistance to Rome, the Celtiberian tribes maintained their heritage of warrior elites, and their hatred of Rome. They accepted the comforts, infrastructure and the benefits of Empire, while remaining independent tribal city-states under the control of noble families. The heroine, Marella is the daughter of one such family. The Lusones were one of the most powerful tribes in northern Hispania, with their power centred in Caesaraugusta. To the west, the most influential family was the Arevaci. Their base was the tribal capital of Numantia, a place as revered in Spanish history as Masada in the Holy Lands, and for much the same reason. Falsely accused by a vile and corrupt Druidic high priest, she is set to be executed. Her rescuer is Marcus, a Roman deserter from Britannia who has made his home in the Gallego valley above Caesaraugusta. Finding no purpose in the life he leads, bored and frustrated, he relishes the chance to face the challenges that come with saving the life of this young noblewoman. Her best chance of survival lies in travelling across the province to Numantia, and her only chance of survival is to do that with Marc. Somehow they must stay ahead of High Priest Leucetius and the priests of a Romanised and corrupted temple; Marella’s noble brother Taran and his standing army; and Rome herself. Away from the capital, the Roman world was a complex, sometimes bloody blend and clash of cultures. The people were as many and varied as they are today, not stereotypical Roman ladies and gents consumed by the politics of Caesar’s court. 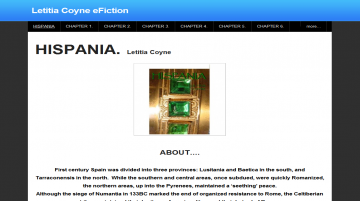 Hispania is a glimpse into the less well known lives of Rome. HISPANIA has not been tagged yet. Help others find HISPANIA by tagging it! HISPANIA has not been reviewed yet. HISPANIA has not been recommended yet.